Trail users are instructed to stop by a flashing red beacon and a stop sign at the cross walk. Approaching traffic is alerted to the presence of trail users at or approaching the cross walk intersection by flashing amber beacons. The Cross Alert System installs quickly and inexpensively, requiring no electrical work or conduits. 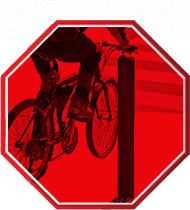 Motion detection guarantees that approaching trail users trigger the lights at the crossing. 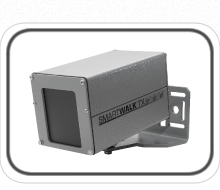 Cross Alert Systems manufactures and sells solar powered, motion activated, radio-controlled enhanced warning signals for recreational trail/public road intersections. 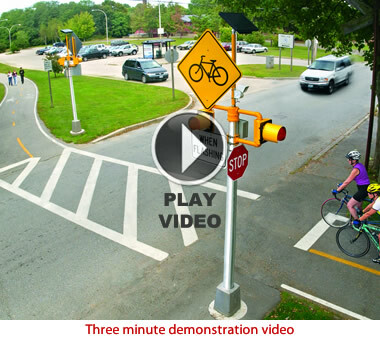 The Cross Alert system enhances visibility at bike path (or other recreational path) and public road intersections. This device is ideal for mid-block crossings. Our system is an active warning system that flashes only when path users are at the intersection. The Cross Alert system is used at intersections where signals to stop vehicular traffic are not indicated, but an active warning system could provide enhanced safety where sight distances are poor or the view of the path is obstructed. 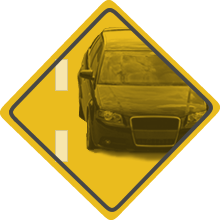 The system does not alter the flow of vehicular traffic, but provides a forewarning to oncoming vehicles that path users are near or at an intersection.